Kangkong, or water spinach as it is sometimes known, is one of my favourite vegetables. This is quite a simple dish to make -- and it makes a nice change from our usual stir-fry with garlic version. 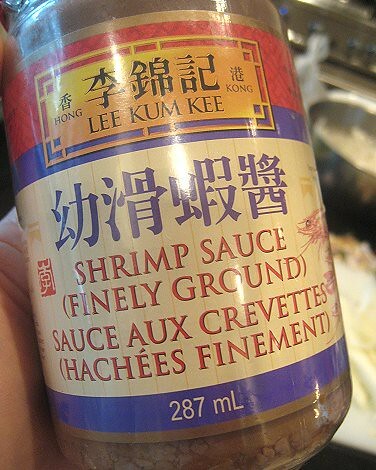 The "Cantonese" ingredient in this case is shrimp paste. Of course, like all shrimp pastes, this is very pungent and is usually an acquired taste for those unfamiliar with it. In this case, it is used sparingly just to add a little flavor to the greens. So perhaps using shrimp paste in this way is a good start for beginners. I start with some oil, some garlic, a birds-eye chili sliced lengthwise because I don't want the dish to be too spicy, and a tablespoon of shrimp paste. The shrimp paste is quite salty, so I find there's no reason to salt anymore. A quick stir-fry is all the kangkong needs, enough to coat it with the sauce -- don't overcook as kangkong will turn brown-ish grey and the stalks will lose its crunchiness. I confess, the sliced red bell peppers were purely ornamental. It's all for the blog! Cut kangkong into 2-inch or 3-inch lengths. Wash and drain. In a hot wok, add vegetable oil. Then add garlic cloves and the shrimp paste. Stir for a few seconds. 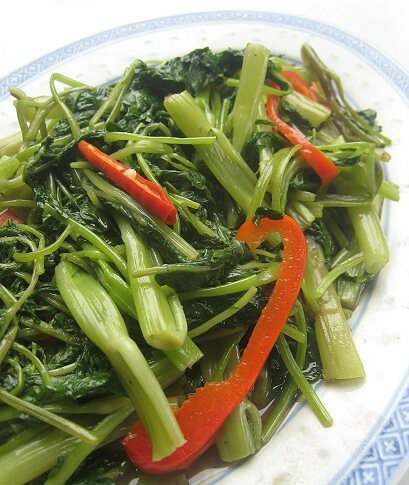 Add sliced kangkong and bell peppers. 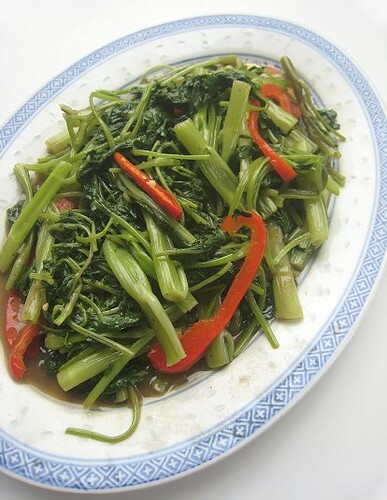 Cook for a few minutes until kangkong has wilted but is not overcooked. Thanks for making this recipe using the Shrimp paste! I now have reason to get this sauce now! This is fascinating! I am going to look for shrimp paste and see if I can incorporate it with my own Lebanese recipes. Love it with this vegetable but don't know if it is available here in lebanon. Another favourite in my family (minus the bell peppers...). Although, interestingly, I was taught to use fermented soybean paste and not shrimp paste. 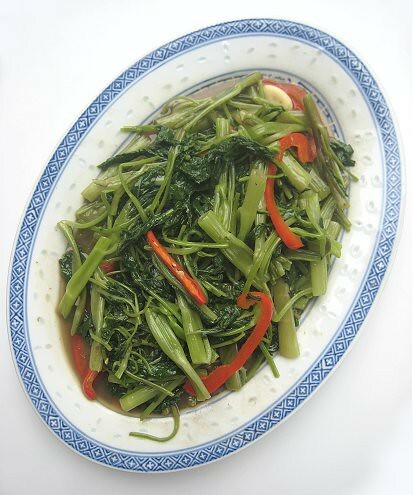 I love stir-fried ong choy! Hmm, maybe not, re availability of kangkong/water spinach in Lebanon. I believe it grows in very wet conditions. Those different kinds of soybean pastes are so confusing! We may have fermented soybean paste in the house, but I wonder if it's the same one you're referring to. I think belacan is scarier than the Cantonese shrimp paste! LOL.